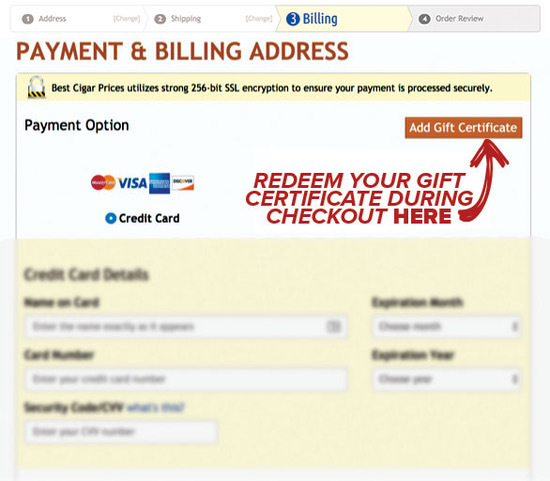 How do I redeem my Best Cigar Prices Gift Certificate on an online order? Once you have your selected items in cart, "proceed to checkout". Address, Shipping, Billing, & Order Review. After you complete the Address and Shipping portions of checkout, you'll see the orange "Add Gift Certificate" button on the Billing page (see screenshot below for example.) Simply click this button and enter your Gift Certificate Id in the field provided, then click the "Add Gift Certificate" button and your Gift Certificate will be applied to your order. You will see this reflected in your order total.